We can’t address the huge $9.5 trillion field of government contracting alone. We want to build a global field of policy and practice around open contracting to begin to reach the scale that we need. To that end, we mapped and analyzed our network for the first time last year. We used on our team’s email metadata: To, From, and CC’s as the basis of that map. It is information that we naturally produce in the course of doing our work which should be a pretty accurate “footprint” of the collaborations that we’ve built over the course of the year. This year, we took our mapping a bit further and began linking our email information to other data to create a more detailed picture of what has been happening and where the opportunities for us to improve our engagement with our allies are. Our network has doubled in size (and now we want to double it again by 2018). We see focused collaboration happening in nine big communities – three more than the previous year. Those big communities have grown even bigger. The total number of people in our top communities has increased by almost 70%. The interconnectedness of the network has increased by about 30%. As more people are coming into the space they are getting plugged in with a richer group. A key shift in our thinking has been to focus more on building connections amongst our network. If you compare this year’s network to last year (below, top and bottom), one thing you’ll notice is how much denser and tightly knit it is. What you’re seeing is the growth of “degree,” which counts contacts directly connected (by email subjects or cc’s) to an individual. To understand people’s interconnectedness for the network as a whole, we find the median degree score for everyone that year. It grew from 7.2 to 9.7 over the past year – i.e. by about 35%. With our innovation challenge and our global event coming up, we hope that this number will grow even more shortly. Ethan Zuckerman from MIT Center for Civic Media has said that “participation at scale means devolving control.” Achieving great scale for the open contracting field will involve getting more of our partners and allies empowered to lead open contracting implementation projects and reforms independently. We can help with tools, support, evidence, inspiration and connections that make that possible but we need to make sure others can deliver open contracting. So, when evaluating the network this year, we looked at everything through that lens. As a result, we revised some of our indicators to focus on the number of people in the network and its strengthened connections, rather than on the number of communities or particular areas of engagement. We care about the movement as a whole, and if the size of the network stagnates, then it doesn’t matter how many groups we’re interacting with therein. We need both need to grow, along with connections between people. One step that we took to evaluate how well we’re doing at making those connections was to look at data from our CRM (client relationship management) database. It includes information about which countries are implementing or publishing, and which partners are associated with those countries. We saw that some of these people were well integrated into the network. It was clear that we have been doing a good job linking experienced implementers to others in the field. Perhaps we were doing a less good job with newer partnerships, so of whom were farther out, not being linked to others. This is a waste of human capital: we have great partners who may not being linked to newcomers for support and also for learning. And, in one case, this was happening for all our contacts in a particular country. This pushed us to consider where we may need to offer more support or connections, especially in areas where we don’t work as often. While open contracting implementation efforts can achieve great results in the relatively short term, transformational work requires prolonged, sustained collaboration. And it’s not only about projects or a technological fix, it’s also about advocacy, spreading the stories, hashing out critical ideas and being willing to learn together. These are all important characteristics in our allies. 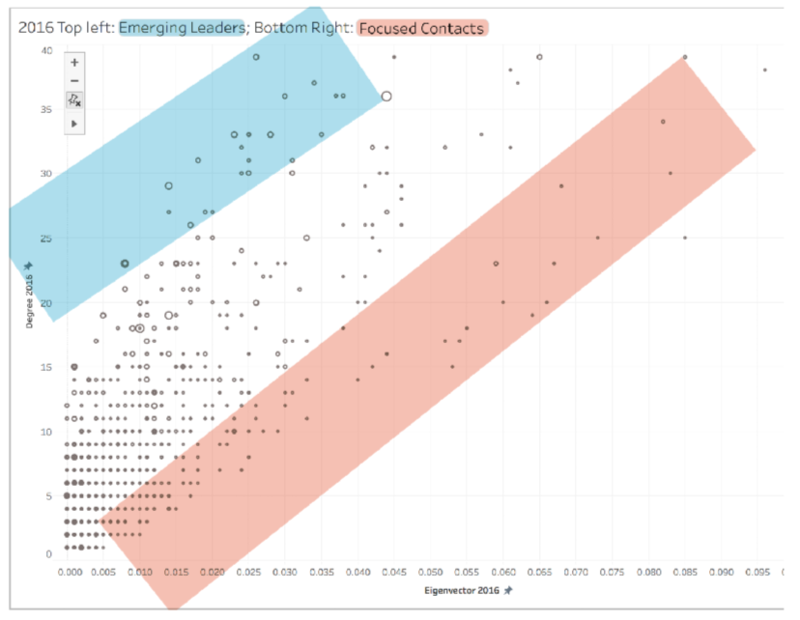 To boost that effort, we did several analyses that would help surface “hidden influencers,” individuals who have big personal networks, or who are strong collaborators, or people involved in significant implementation progress. 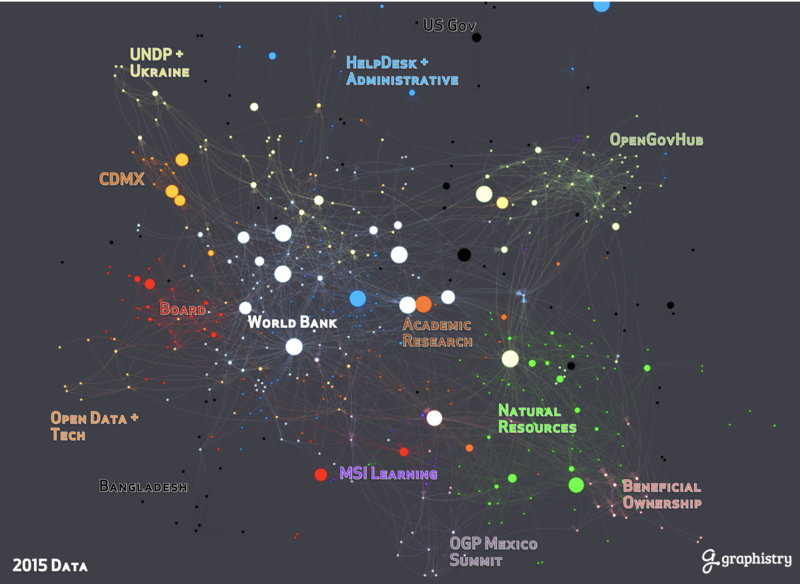 As expected, most of these people were already well connected and at the center of our network map, but some had drifted to the edges compared to the previous year. While we may not need to provide active support to those partners at this point, we need to be connecting them to newcomers to the field. We don’t want them to drift off too far. One of our refreshed strategy targets is to see more funders supporting open contracting programs at other organizations so we looked at how we had been collaborating with people from each of our funding organizations. Some are centered and well connected in the network – meaning we link them (or they link us) into a lot of conversations within the network. That’s good for getting their wisdom out to more people in the field, and for increasing the likelihood of more open contracting innovators getting funded. 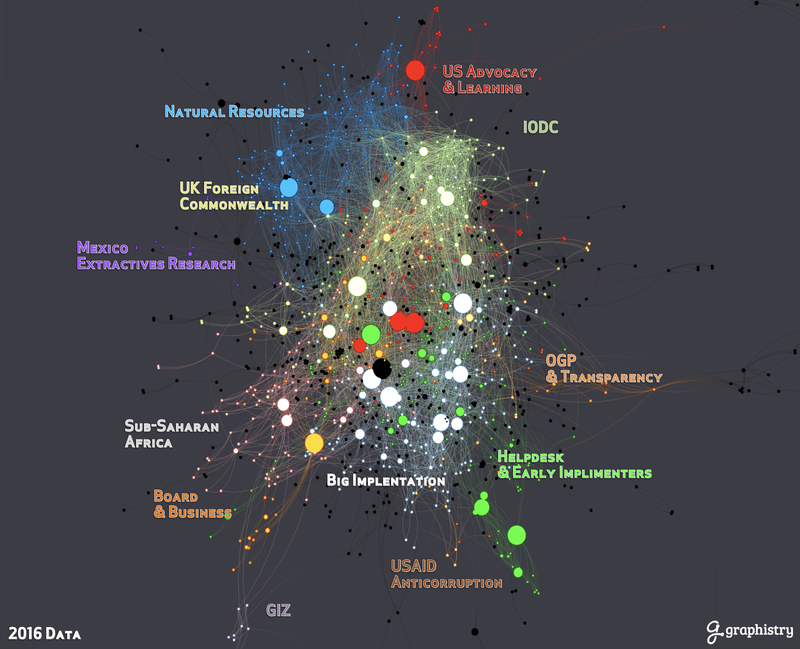 In the case of Hivos, the Open Society Foundation and the Omidyar Network, for example, we could see those kinds of collaborations clearly represented on the map. We also saw where we have room to develop these relationships with some of our other funders further. Having a core group of allies in the open government and open data spaces is a real asset. At the same time, if we want to change the world, we need allies further out to ‘spread the word.’ We also need to check that smaller projects, or those further away from where we work most, are not being missed or overshadowed. We analyzed our ‘implementation pipeline’ to see how we’ve been connecting established partners with more and less experienced actors in the field. 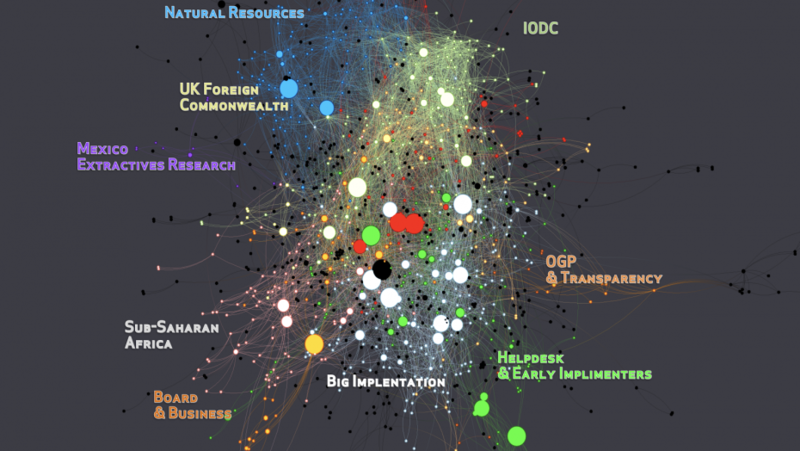 Our pipeline list isn’t comprehensive of everyone worldwide who may be implementing (our work is based on an open data standard after all), but it does give us a big picture of the early and advanced implementers who we’ve been in contact with. And while we found that we are doing a good job of connecting (most) publishers with each other, we could be doing better at connecting those experienced people with newer implementers. For the moment, this isn’t too much of a problem, since we have been distilling global learning through our help desks and other OCP resources. 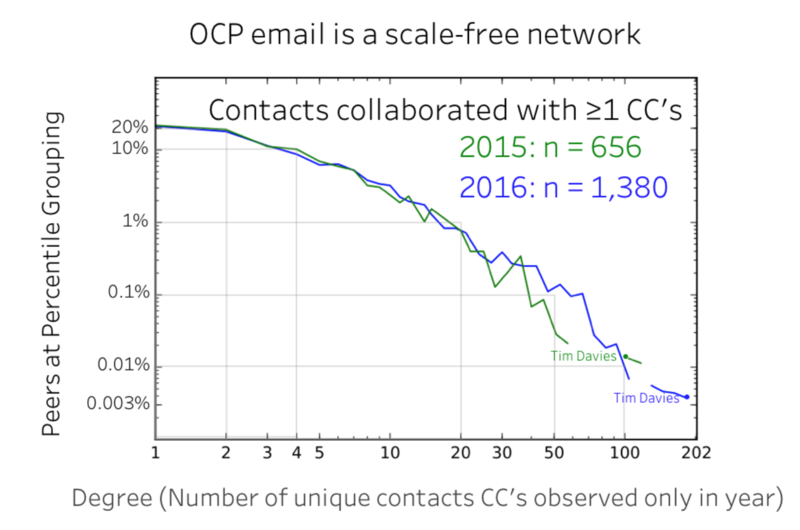 But as we gradually move towards being less central in the field in the future, we may need to make more of those connections. 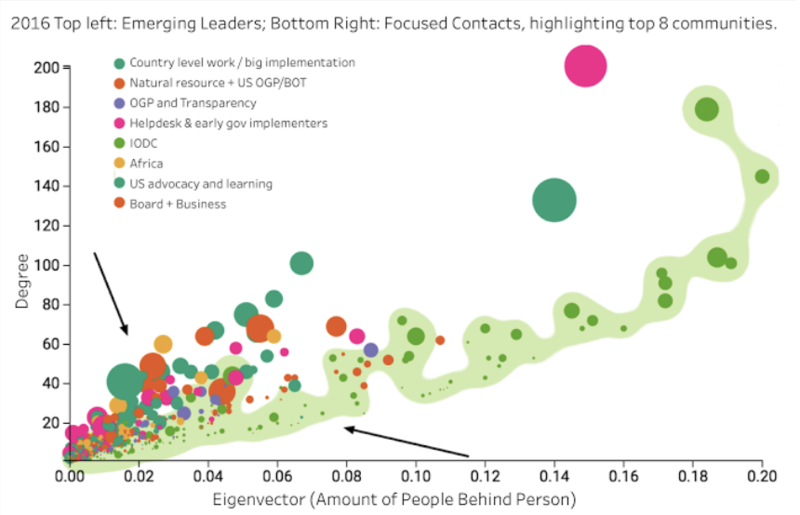 We took a similar approach with a list that we have of ‘key influencers,’ to understand how we were connecting some our open contracting champions to the rest of the field, through events, workshops, etc. Beyond funders and implementers, we wanted to highlight individuals who were connecting us to a lot of people. In doing the analysis at left, for example, we were able to identify several great collaborators in our network who have been doing just that. The people represented in the blue section have been getting well connected in our network, and those toward the high end of the blue area have also connected with especially central people in the network. We call these people Emerging Leaders because of that balance. It was interesting to note that many of them come from countries and regions outside the US/UK/EU sphere. We know that for open contracting to take off we need advocates around the world; this helped us confront some biases that might be slowing down that effort. 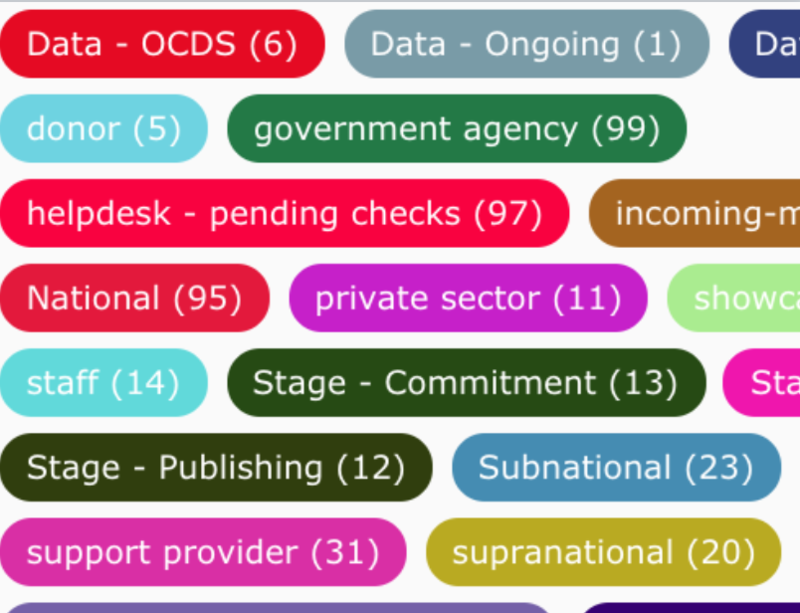 The goods and services needed from the OCP to help transform public contracting wherever you are working. We want to get feedback to make our resources, arguments, and support even better. What we can do to send our allies and partners out further and make them better equipped. To do that we need to identify gaps in outreach and engagement, geographically, sectorally, and in user groups. Identifying and empowering more ‘hidden influencers.’ To do this, we want to engage (and hopefully convert) critics and skeptics. We also want to connect more implementation innovators to people who want to learn from them and link newer folks to those who will not just convince them, but inspire specific action. If you’d like to help us with any of these goals, let us know. As you can imagine, network navigating and field-building are part of a long haul, and we’re just starting to pass some early milestones. We know that some of these practices are being used in organizations within and beyond our field. So we would love to hear your ideas and learn how you approach similar issues in your own work. So let us know, how do you use information about your networks to mobilize partners and change everything?